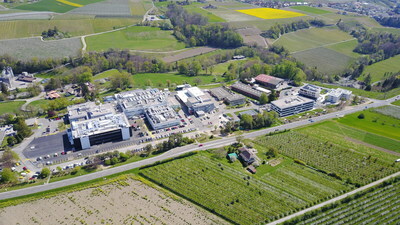 AUBONNE, Switzerland, March 28, 2019 /PRNewswire/ -- Merck, a leading science and technology company, today announced an investment of €150 million (165 million Swiss francs) in its manufacturing site at Aubonne, Switzerland, to expand manufacturing capacity for its biotech medicines. The investment will cover a new building dedicated to Merck biotech medicines destined for more than 150 countries, helping to meet increasing patient needs for flagship medicines such as fertility treatment Gonal-f®, newly launched therapies such as cancer drug Bavencio® and potential future products currently in clinical development such as cancer investigational treatment M7824 (bintrafusp alfa*). With the sites of Aubonne and nearby Vevey, Switzerland is Merck's prime hub for manufacturing biotech medicines. With this latest expansion, Merck will have invested more than 1 billion Swiss francs (€800 million) in Switzerland over the past ten years, reflecting the strategic importance of the country, where it employs 2,300 employees across 11 locations. The Aubonne and Vevey sites are part of a network of 18 manufacturing sites worldwide dedicated to the production of Merck's biotech and pharmaceutical medicines and serving 70 million patients across the globe each and every day. Merck, a leading science and technology company, operates across healthcare, life science and performance materials. Around 52,000 employees work to make a positive difference to millions of people's lives every day by creating more joyful and sustainable ways to live. From advancing gene editing technologies and discovering unique ways to treat the most challenging diseases to enabling the intelligence of devices – the company is everywhere. In 2018, Merck generated sales of € 14.8 billion in 66 countries.